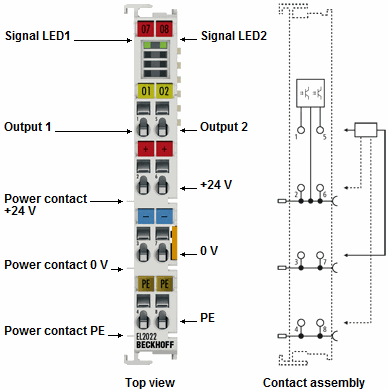 The EL2022 and EL2032 digital output terminals connect the binary control signals from the automation unit on to the actuators at the process level with electrical isolation. 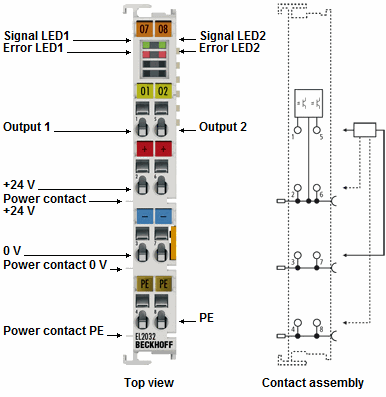 The EtherCAT Terminals offer short-circuit protection of the outputs and contain two channels that indicate their signal state by means of light emitting diodes. The EL2032 enables direct connection of two 3-wire actuators; diagnostic LEDs and input bits indicate short circuits and wire breakage.